Summary: India, 1986: Mukta, a ten-year-old girl from the lower caste Yellamma cult of temple prostitutes has come of age to fulfill her destiny of becoming a temple prostitute. In an attempt to escape this legacy that binds her, Mukta is transported to a foster family in Bombay. There she discovers a friend in the high spirited eight-year-old Tara, the tomboyish daughter of the family, who helps her recover from the wounds of her past. Tara introduces Mukta to a different world—ice cream and sweets, poems and stories, and a friendship the likes of which she has never experienced before.As time goes by, their bond grows to be as strong as that between sisters. In 1993, Mukta is kidnapped from Tara’s room. 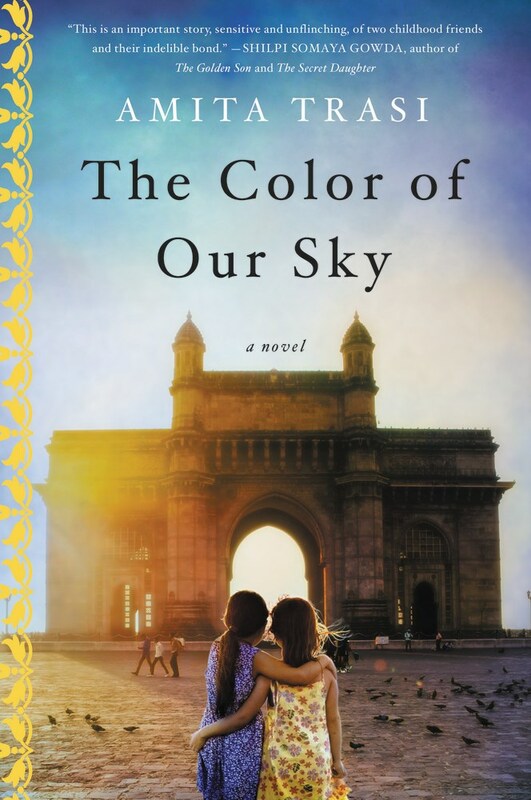 Review: As The Color of Our Sky opens, Mukta's mother is determined to save her daughter from the life of prostitution that she and her mother before her have known. But Mukta's grandmother long ago accepted that serving as a temple goddess or prostitute is their family's lot in life. After all, much like a crown is passed down in royal families, your caste and/or employment options are passed down through your family in Mukta's world. And while readers are well aware of what Mukta's fate will likely be, an innocent child such as she is is not. Tara is a child of privilege in that she is never in danger of living the kind of life Mukta has been or will be subjected to, but when the two are brought together, they become sisters of the heart. It is only Tara's selfishness and hurt that drives a wedge between the girls and leads to their separation, or so she believes. As an adult Tara searches for the woman she once shared secrets with, she matures and learns that not only was she keeping secrets, Mukta was also. I loved the story of Tara and Mukta. Tara's growth from the time she leaves America and finds herself back in India is wonderful to watch. Mukta's faith in Tara, even after she shunned her in the past, and holding on to the belief that her friend, her sister, her confidante would find her and rescue her was moving. Amita Trasi does a great job of moving back and forth between Tara and Mukta's story lines and keeping readers interested and engaged. Even though I guessed early on about the outcome of part of the story, it didn't take away from my overall enjoyment of the book. Fans of Chitra Banerjee Divakaruni, Shilpi Somaya Gowda or Thrity Umrigar will definitely enjoy The Color of Our Sky.